One week after an overturned tanker caused a nightmarish commute around D.C., another big incident on the Beltway caused headaches Thursday afternoon. Traffic on the Capital Beltway had been stopped due to a tractor trailer crash and fire between exits 173 (Van Dorn) and 170 (Springfield) in Alexandria. 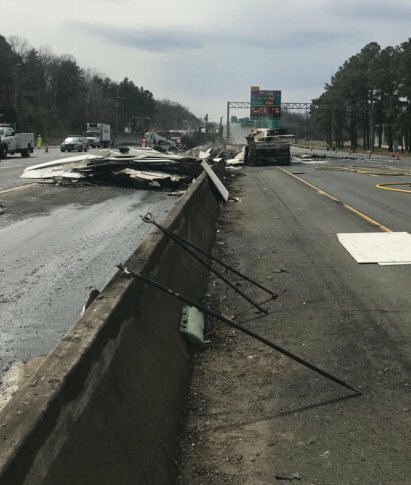 The tractor trailer struck the jersey wall on the Inner Loop sometime around 1:35 p.m. and spilled part of its cargo onto the Outer Loop lanes, according to a statement from the Virginia Department of Transportation. That cargo of insulation then caught fire, Virginia State Police said. The driver is safe. As of 4:25 p.m., all travel lanes had been reopened and the cleanup was finished, but it was still slow around the scene. Earlier, VDOT warned that the impacts could be felt into the rush hour. “Consider remaining at work or home or staying off of the interstate. Commuters should avoid the area and seek alternate routes,” they said in a statement. Some listeners affected by the incident shared their perspectives with WTOP, and it was about what one would expect. “I was sitting in bumper-to-bumper for a half-hour — like standstill … nothing,” said one. Another listener had been stuck since 2:10 p.m. “We are inching along, but at least we’re not sitting anymore,” she said. Metro added cars and trains to the Blue Line to accommodate commuters affected by the crash. The incident comes exactly one week after an overturned tanker blocked the Inner Loop near the American Legion Bridge and disrupted traffic for over 13 hours.